Built by Northrop Grumman and first used by the U.S. Navy in 1964, the E-2C Hawkeye has served as an airborne early warning and command and control aircraft in the Vietnam and Persian Gulf wars, as well as in the war on drugs. It is also in service with five foreign governments. The most distinctive feature of the E-2C, which provides simultaneous air and surface surveillance, is its rotating 24-foot (7.3-m) radar dome above the fuselage. from 1954 to 1964. 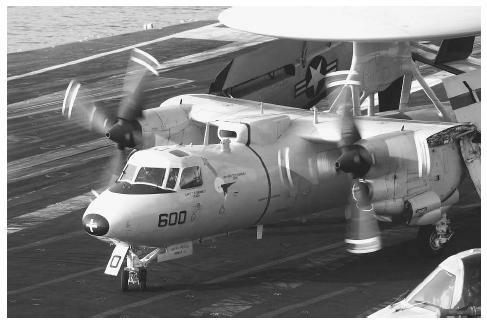 In 1964, the navy phased in the E-2 Hawkeye, the first aircraft designed to be carrier-based and serve an all-weather airborne early warning and command and control function. Nine years later, in 1973, Grumman introduced the E-2C model. Over the next three decades, the E-2C underwent five major changes, with the fifth, known as Hawkeye 2000, introduced in October 2001. Using computerized sensors to provide early warning, the E-2C is a high-wing aircraft whose rotating dome contains stacked antennae. The airflow over and around the dome necessitates the second most distinctive of its design features, a multiple-surface tail unit. In addition to their service in Vietnam, Hawkeyes directed F-14 Tomcat fighters on combat air patrol during strikes against terrorist-related Libyan targets in 1986. They also directed both land attacks and combat air patrol missions over Iraq during the Persian Gulf War, providing control for the shootdown of two Iraqi MiG-21 fighter jets by carrier-based F/A-18s in the first days of the conflict. E-2Cs have also served with the Drug Enforcement Administration and other law-enforcement agencies for the interdiction of smuggled drugs. The governments of Egypt, France, Japan, Singapore, and Taiwan have purchased E-2Cs, which are engineered in Bethpage, New York, and produced and modified in St. Augustine, Florida. Chant, Christopher. An Illustrated Data Guide to Modern Reconnaissance Aircraft. London: Tiger Books International, 1997. Hardy, M. J. Sea, Sky, and Stars: An Illustrated History of Grumman Aircraft. New York: Sterling, 1987. Dietrich, Bill. "Engineering—Here's What You Can Expect Next Century." Seattle Times. (December 15, 1992): D1. Wilson, George C. "Drug-War Radar Picks up a Funding Blip." Washington Post. (April 14, 1987): A21. "Young Defends $13 Billion CVN-21 Development Investment." Defense Daily 217, no. 32 (February 19, 2003): 1. E-2C Hawkeye. United States Navy Fact File. < http://www.chinfo.navy.mil/navpalib/factfile/aircraft/air-e2c.html > (March 9, 2003).